Thanks to Facebook fan Carol for sharing her boys' celebration photo! It’s back to school time again in Kitsap County! Here’s hoping all of our young Mora fans have their best school year yet. 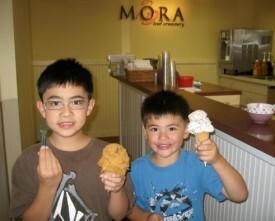 We invite you to start a new tradition celebrating the school year’s beginning by stopping by one of our Mora Iced Creamery locations for a sweet treat. As always, sprinkles are free for our young ice cream lovers! previous post: Best of Western Washington Voting is Underway!